Description: The final release in this series contains a shorter version for a smaller orchestra of an overture which appeared on Vol. 1 (06Q001) and two suites (from 1928 and 1904) which are for all intents and purposes, brilliantly conceived and orchestrated pieces of light music worthy of, for example, O’Brien’s exact contemporary Haydn Wood! 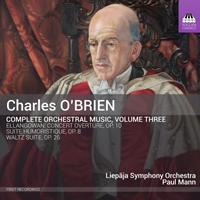 Liepāja Symphony Orchestra; Paul Mann.